If a window senses any obstacle while it is closing automatically, it will stop and lower approximately 12 inch (30 cm) to allow the object to be cleared. If the window detects the resistance while the power window switch is pulled up continuously, the window will stop upward movement then lower approximately 1 inch (2.5 cm). 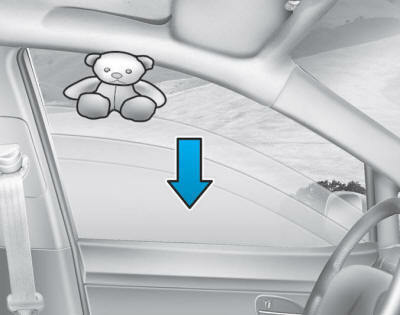 If the power window switch is pulled up continuously again within five seconds after the window is lowered by the automatic window reversal feature, the automatic window reversal will not operate. The automatic reverse feature is only active when the “auto up” feature is used by fully pulling up the switch to the second detent. Make sure heads, other body parts or other objects are safely out of the way before closing the windows to avoid injuries or vehicle damage. Objects less than 0.16 inch (4 mm) in diameter caught between the window glass and the upper window channel may not be detected by the automatic reverse window and the window will not stop and reverse direction.